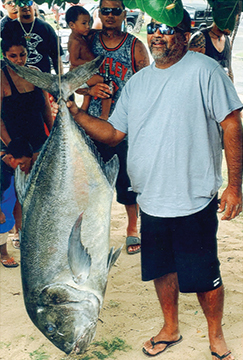 Charles Joseph, Jr. was competing in the 2016 Hook Um & Cook Um Tournament on the north shore of Oahu when he made his monumental catch. Charles was using a 13-foot Shimano pole, Shimano Tiagra 80s reel and 100-lb test Ande when he hooked this fish. Hook Um & Cook Um Tournament winner two years in a row.